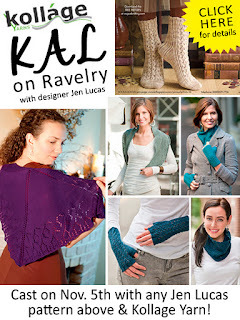 I am pleased to announce that Kollage Yarns will be hosting a KAL with my patterns in their Ravelry group in November and December! Choose any of the patterns above - Candlelight Shawl, Vokuhila Socks, Bonnie Jean, Winchester, River Run - and pair it with Creamy, Sock-a-licious, 1/2 N 1/2, or Luscious! Cast on Nov 5 and keep posting your progress, questions, comments in this thread and you will be eligible for fabulous prizes along the way! knitlikecrazy will be checking in daily to cheer us on and give us advice! Finish your project by midnight EST December 31st, share your finished project with the group, and be eligibile for the grand prize! Even though I can't win the prize from Kollage, I still have plans to knit along. I will be knitting the Bonnie Jean shawlette. If I manage to get that done, then I need a pair of the Winchester mitts for myself! With the holidays coming and these projects being small, it's a great way to get some of that holiday knitting done with the chance of winning a prize at the end!